Incorporating seeds into your diet is highly beneficial to health as most seeds are packed with dietary fibre, protein, minerals, healthy fats and antioxidants. There are lots of ways to consume them, enjoy them as snacks, in smoothies, on muesli, in cereal bars and so on. 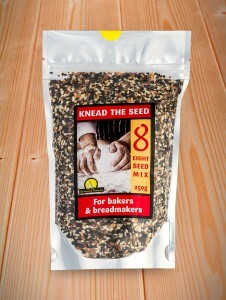 As more and more people enjoy baking, we decided to contribute with carefully selected special mixes of seeds for bread. Our mixes are designed for use when making bread either by hand or in a breadmaker. Adding a bread seed mix enables you to be adventurous with your baking, creating your own artisan breads. The results are healthy, tasty and textured loaves that are simply magnificent. Many bread making machines have a dedicated seed dispenser, but if you are kneading your bread by hand, our mixes are easy to incorporate into your handmade dough. Two mixes of bread seeds are available for your delectation, both meticulously researched and repeatedly tried and tested at Seasoned Pioneers before their launch into the gourmet food market. 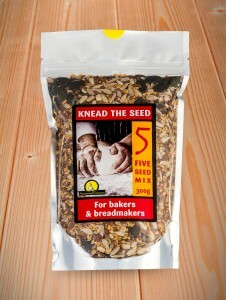 We named our bread seeds ‘Knead the Seed’ to inspire and encourage bakers everywhere to liven up their bread making! The first bread seed mix is the Knead the Seed 5 seed mix, consisting of golden and brown linseed (also known as flaxseed), sunflower seeds, pumpkin seeds and chia seeds. All of these are renowned for their high nutritional value and the combination is a flavoursome and crunchy mix of seeds for bread making. Chia seeds are proclaimed by some to be a ‘super-food’ as they contain calcium, manganese and phosphorus and are a great source of healthy omega-3 fats. Our second bread seed mix is the Knead the Seed 8 seed mix, which is a finer mix of mini bread seeds giving a less textured and less crunchy result whilst still adding immense flavour and an aesthetically appealing finish. The combination of white sesame seeds, brown linseed, black sesame seeds, nigella seeds, chia seeds, blue poppy seeds, white poppy seeds and golden linseed is both nourishing and wholesome. However, do not consider either mix as purely seeds for bread, they are fabulous used in a profusion of ways! We suggest using the 5 seed mix by sprinkling it into stir-fries or over salads and incorporating into muesli, granola, yoghurt or pasta dishes. The mix is also great toasted before using as a topping for porridge with a drizzle of honey or maple syrup and it makes a great wholesome snack for lunch boxes. The 8 seed mix is perfect sprinkled into stir-fries or smoothies and over salads, muesli, granola, yoghurt, pasta and dips. Each convenient resealable pouch of either seed mix contains approximately 30 tablespoons of seeds, so if you’re making seeded bread you can make at least ten large loaves.